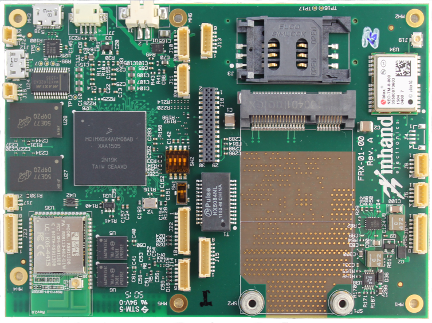 Based on the NXP™ i.MX 6 SoloX processor, InHand created the Fury-X single board computer (SBC). This embedded system enables space- and power-optimized circuitry for real time control and cloud communication for Internet of Things (IoT) and other high reliability applications. The Fury-X offers a wide variety of peripheral interfaces for interconnection with sensors, transducers, motors, and cameras for real time applications in combination with multiple network and Human-Machine Interface (HMI) communications options. 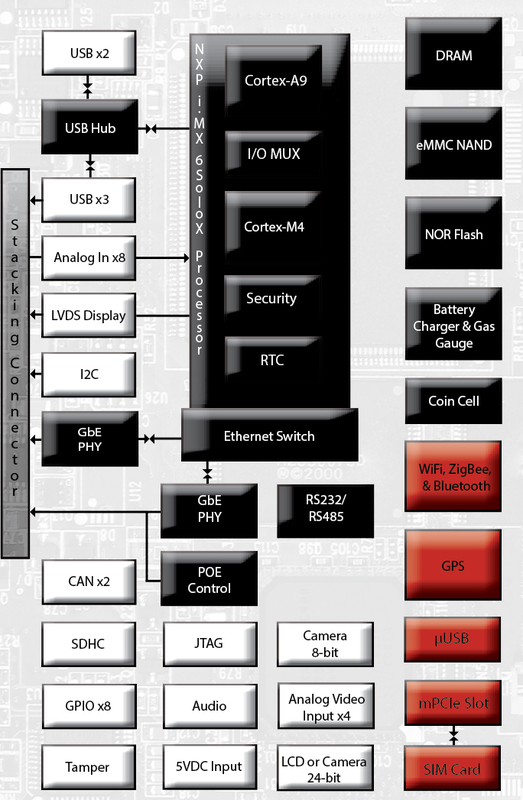 The NXP SoloX processor features two heterogeneous ARM cores. The Cortex-M4 enables real time control with low power consumption while running a real time operating system (RTOS) such as FreeRTOS or MQX. The Cortex-A9 manages external network and graphics communications via a higher level operating system, such as Linux or Android, and may be powered down when not communicating to conserve power and minimize heat. The Corte x-A9 may also be utilized for local data processing when the Cortex-M4 is not sufficient. The Fury-X IoT Platform includes the processor, DDR3, NAND flash, real time clock (RTC), watchdog timer, and peripheral interfaces such as: SPI, I2C, UART, CAN, USB 2.0 OTG, 3 USB 2.0 Hosts, two 10/100/1000 Ethernets (one is Power over Ethernet (PoE) capable), Wi-Fi/Bluetooth/ZigBee module, and LVDS video output. A companion daughter card provides expanded peripheral connectivity. InHand provides a Linux BSP to run on the Cortex-A9. FreeRTOS and MQX RTOS are available to run on the Cortex-M4. Inter-processor communication is provided via BSP APIs that utilize SoloX hardware semaphores, interrupts, and memory buffers. These BSPs and integrated hardware-facilitated interprocessor communication enable a seamless programming model in combination with space- and power-optimized electronics. The SoloX processor provides peripheral mapping capability, allowing any Fury-X peripheral to be controlled by the Cortex-M4 (real time), the Cortex-A9, or shared via semaphore and interrupt-based management. For customers with specific product requirements, InHand’s engineering services can create custom solution daughter cards for the Fury-X, or combine the Fury-X with additional features to optimize recurring cost. Ethernet Dual 10/100/1000 Ethernet MAC + PHY. Switch inside SoloX processor. One Ethernet is Power over Ethernet (POE) capable. Operating System Cortex-A9: Linux 3.14 (or later). Cortex-M4: FreeRTOS, MQX. Consult factory for Android, VxWorks, and Windows availability.